Decreases in aerosols over the 21st century as projected by the Representative Concentration Pathways (RCPs) lead to increases up to 0.5 - 1 ºC in global temperature and up to 0.05 - 0.1 mm/day in global precipitation, depending strongly on present-day aerosol radiative forcing. In East Asia, future aerosol decreases could be responsible for 10-20% of the total temperature increase (30-40% with strong present-day aerosol forcing), even under the high greenhouse gas emissions scenario (RCP8.5). In this model sensitivity study we compare and evaluate the surrogate tracers CO2, CO, δ13C-CO2 and Δ14C-CO2 for estimating continuous anthropogenic CO2. The results can be used to optimize the measurement network design with respect to the partitioning of total CO2 into biospheric and anthropogenic CO2 contributions. This enables improvement and validation of highly resolved emission inventories using atmospheric observation and regional modeling. In mid-latitudes, the major fraction of precipitation is initiated via the ice phase. Cloud model simulations estimated the role of aerosol particle types and heterogeneous freezing modes on the ice phase. The results show that the formation of mixed-phase and ice clouds is promoted by the immersion freezing mode, broad drop size spectra containing small as well as large drops, insoluble particles composed by bacteria, feldspar, and illite, and temperatures below -25°C. We study the potential of the European Integrated Carbon Observing System (ICOS) atmospheric network for estimating European CO2 ecosystem fluxes. Regional atmospheric inversions with synthetic data are used to derive it in terms of statistical uncertainty. This potential is high in western Europe and future extensions of the network will increase it in eastern Europe. Future improvements of the models underlying the inversion should also significantly decrease uncertainties at high resolution. We present a new retrieval method for ammonia (NH3) concentrations and total columns from ground-based Fourier transform infrared (FTIR) observations. Observations from Bremen, Lauder, Réunion and Jungfraujoch are used to show the capabilities of the new retrieval. The developed retrieval provides a new way of obtaining time-resolved measurements and will be useful for understanding the dynamics of ammonia concentrations in the atmosphere and for satellite and model validation. We use a global climate model with an explicit source tagging technique to quantify contributions of emissions from various geographical regions and sectors to BC in North America. Model results are evaluated against measurements of near-surface and in-snow BC. We found strong spatial variations of BC and its radiative forcing that can be quantitatively attributed to the various source origins, and also identified a significant source of BC in snow that is likely missing in most climate models. Detailed 222Rn flux maps are a prerequisite for the use of radon in atmospheric transport studies. We present a high-resolution 222Rn flux map for Europe, based on a parameterization of 222Rn production and transport in the soil. Spatial variations in 222Rn exhalation rates are determined by soil uranium content, water table depth and soil texture. Temporal variations are related to soil moisture variations as the diffusion in the soil depends on available air-filled pore space. 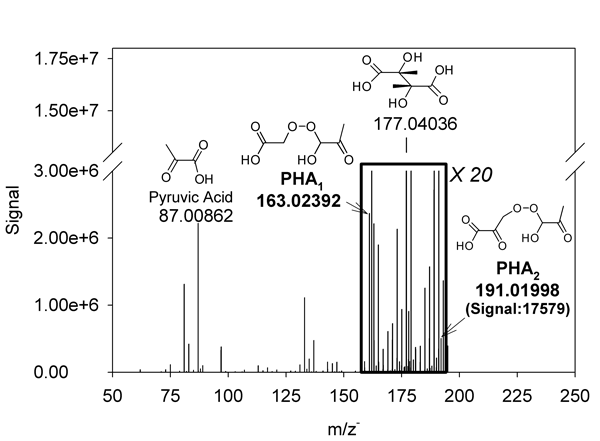 This paper demonstrates organic peroxide and peroxyhemiacetal formation during aqueous photooxidation of methylglyoxal using ultra-high-resolution Fourier transform ion cyclotron resonance electrospray ionization mass spectrometry (FTICR-MS). Then, we provide simulation results of organic peroxide/peroxyhemiacetal formation in clouds and wet aerosols and discuss organic peroxides as a source of condensed-phase OH radicals and as a contributor to aqueous secondary organic aerosol (SOA). A comprehensive characterization of submicron aerosol composition and sources at 260m in urban Beijing during APEC 2014 is presented. Aerosol species were shown to decrease substantially by 40–80% during APEC, whereas the bulk composition was relatively similar to the result of synergetic controls of secondary precursors. Our results elucidated that the good air quality during APEC was the combined result of emission controls and meteorological effects, with the former playing the dominant role. For the first time the shape of noctilucent cloud particles is analyzed with a 3-D Lagrangian model. Three-color lidar measurements are compared directly to optical modeling of NLC simulations with non-spherical shapes: a mix of elongated and flattened cylindrical ice particles consistent with measurements. Comparison is best if flattened particles form a majority, with mean axis ratio around 2.8. NLCs from cylindrical particles are slightly brighter and consist of fewer but larger ice particle. In this paper we report on the feedbacks between dust and boundary layer meteorology during a dust storm over Egypt and Libya in April 2012, using an atmospheric composition forecasting system. Dust was found to act on atmospheric stability, leading to an increase (night) or a decrease (day) in dust production. Horizontal gradients of temperature were modified by the radiative impact of the dust layer, leading to changes in wind patterns at the edge of the storm due to the thermal wind effect. No obvious changes were found in annual mean concentrations of major chemical components and PM10 in 2013, relative to 2012. But wintertime mass were quite different; approximately 60% of the winter mass increase from 2012 to 2013 can be attributed to severe meteorological conditions in the HBP area, and mass of chemical components exhibited a decline during 2006 to 2010, and then a rise till 2013. Coal-combustion was still the largest anthropogenic source of aerosol pollution in 2013 in China. The paper explores the microphysical structure of clouds at the high-alpine measurement site Jungfraujoch, Switzerland. High concentrations of ice crystals were measured by a range of instruments. The presence of these high concentrations could not be explained through conventional understanding of ice formation processes in clouds and the possibility that the surface provides a significant source of ice crystals is investigated. We investigated soil production and uptake of H2 and associated isotope effects. Uptake and emission of H2 occurred simultaneously at all sampling sites, with strongest emission where N2 fixing legume was present. The fractionation constant during soil uptake was about 0.945 and it did not show positive correlation with deposition velocity. The isotopic composition of H2 emitted from soil with legume was about -530‰, which is less deuterium-depleted than isotope equilibrium between H2O and H2. Atmospheric carbon dioxide concentration varies seasonally mainly due to plant photosynthesis in the Northern Hemisphere. We found that the satellite GOSAT can capture this variability from space to within 1ppm. We also found that models can differ by more than 1ppm. This implies that the satellite measurements could be useful in evaluating models and their prior estimates of carbon dioxide sources and sinks. Based on 5 years of CO columns derived from the IASI sounder, we show that tropospheric CO displays a diurnal signal with a seasonality and intensity that agrees well with the evolution of fires. We suggest that at night, after the passing of IASI at 21:30, a large amount of CO emissions from the smoldering phase is trapped in the boundary layer before being uplifted the next morning by natural and pyroconvection up to the free troposphere. An intensive campaign was conducted at the Qinghai-Tibetan Plateau using a ground-based single particle soot photometer and a photoacoustic extinctiometer. Significant enhancements of rBC loadings and number fraction of coated rBC were observed during the pollution episode. Biomass burning from N. India is determined to be an important potential source influencing the northeastern Qinghai-Tibetan Plateau. The rBC mixing state is important in determining absorption during the pollution episode. The Pan-European Experiment (PEEX) is introduced. PEEX is a multidisciplinary, multiscale and multicomponent research, research infrastructure and capacity-building program. This paper outlines the mission, vision and objectives of PEEX and introduces its main components, including the research agenda, research infrastructure, knowledge transfer and potential impacts on society. The paper also summarizes the main scientific questions that PEEX is going to tackle in the future. In this study, we present a discovery of an internal gravity wave activity and breaking hotspot collocated with an area of anomalously low annual cycle amplitude and specific dynamics in the stratosphere over the Northeastern Pacific/Eastern Asia coastal region. The reasons why this particular IGW activity hotspot was not discovered before nor the specific dynamics of this region pointed out are discussed together with possible consequences on the middle atmospheric dynamics and transport. 1. GOCI (Geostationary Ocean Color Imager) retrieval of AOD is consistent with AERONET AOD (RMSE=0.08-0.1) 2. GOCI-derived PM2.5 is in significant agreement with in situ observations (r2=0.66, rRMSE=18.3%) 3. Population-weighted GOCI-derived PM2.5 over eastern China for 2013 is 53.8 μg/m3, threatening the health of its more than 400 million residents 4. Secondary inorganics (SO42-, NO3-, NH4+) & organic matter are the most significant components of GOCI-derived PM2.5. The Asian summer monsoon provides an important pathway of tropospheric source gases and pollution into the lower stratosphere. This transport is characterized by deep convection and steady upwelling, combined with confinement inside a large-scale anticyclonic circulation in the upper troposphere and lower stratosphere. In this paper, we show that a barrier to horizontal transport in the monsoon can be determined from a local maximum in the gradient of potential vorticity. Stratospheric circulation is thought to change as a consequence of climate change. Empirical evidence, however, is sparse. In this paper we present latitude- and altitude-resolved trends of the mean age of stratospheric air as derived from SF6 measurements performed by the MIPAS satellite instrument. The mean of the age of stratospheric air is a measure of the intensity of the Brewer-Dobson circulation. In this paper we discuss differences with respect to a preceding analysis by Stiller et al. New information is given here on mineralogy, microphysical and optical properties, and radiative effects, of PM10 types from surface rocks at a non-desert site (Rome area, Italy). A large data set was built, by SEM XEDS microanalysis, of mineral particles (silicates, quartz and calcite, depending on rocks). Dust types show different size distribution, optical properties, and radiative effects. Radiative transfer modelling (6SV) based on SEM XEDS data is a further original feature of this work. It is shown here that RegCM4 regional climate model adequately simulates surface solar radiation (SSR) over Europe but significantly over/underestimates several parameters that determine the transmission of solar radiation in the atmosphere. The agreement between RegCM4 and satellite-based SSR observations is actually a result of the conflicting effect of these parameters. We suggest that there should be a reassessment of the way these parameters are represented within this and other models. Landscape fires strongly influence atmospheric chemistry, composition, and climate. Characterizing such fires at very high temporal resolution is best achieved using thermal observations of actively burning fires made from geostationary Earth Observation satellites. Here we detail the Fire Radiative Power (FRP) products generated by the Land Surface Analysis Satellite Applications Facility (LSA SAF) from data collected by the Meteosat geostationary satellites. Characterising the dynamics of wildfires at high temporal resolution is best achieved using observations from geostationary satellite sensors. The SEVIRI Fire Radiative Power (FRP) products have been developed using such imagery at up to 15-minute temporal frequency. These data are used to estimate wildfire fuel consumption and to the characterise smoke emissions from the 2007 Peloponnese "mega fires" within an atmospheric transport model.